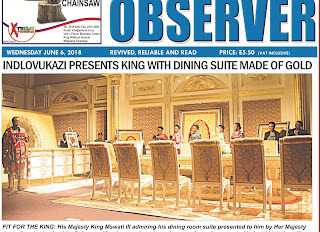 In the week that King Mswati III the absolute monarch of Swaziland / Eswatini received dining room and lounge furniture made of gold as birthday gifts it is reported that children collapsed with hunger in their school because the government had not paid for food for them. The kingdom had previously been warned to expect children to starve because the Swazi Government had not paid its suppliers for the food that is distributed free of charge at schools. The shortage is reported to be widespread across the kingdom. The Times of Swaziland, reported on Thursday (7 June 2018) that at least eight children had collapsed through hunger at of KaKholwane Primary School. It reported the school’s headteacher Smangele Mtsefwa, saying it was because of a lack of food at the school. 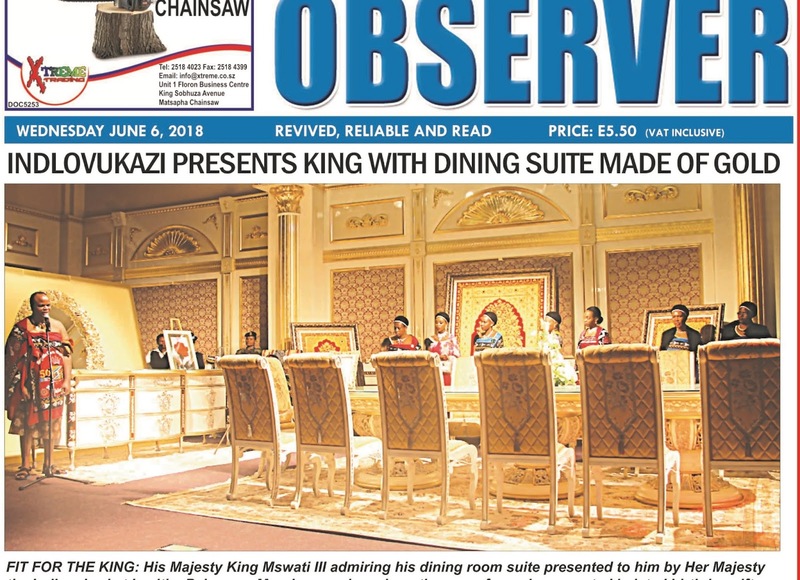 On Monday King Mswati received gifts of furniture made of gold and at lest E15 million in cheques to mark his 50th birthday that fell on 19 April 2018. On that day he wore a watch worth US$1.6 million and a suit weighing 6 kg studded with diamonds. Days earlier he had taken delivery of his second private jet. This one, an Airbus A340, cost US$13.2 to purchase but with VIP upgrades was estimated to have cost US$30 million. In February 2018, children in Swaziland were warned to prepare themselves for starvation as the government once again failed to deliver free food to schools. The Swazi Observer reported at the time that schools relying on government aid – known as the zondle programme – ‘must brace themselves for starvation as the Ministry of Education and Training has failed to deliver food to schools on time’. In a report in May 2017, the World Food Program estimated 350,000 people (a third of the population) in Swaziland were in need of food assistance. WFP helped 65,473 of them. It said it was regularly feeding 52,000 orphaned and vulnerable children (OVC) aged under eight years at neighbourhood care points. About 45 percent of all children in thought to be OVCs.